ATLANTIC OCEAN (Sept. 17, 2011) An E-2D Hawkeye assigned to Test and Evaluation Squadron (VX) 1 makes an arrested landing aboard the aircraft carrier USS Dwight D. Eisenhower (CVN 69). "Attaining E-2D full-rate production is the culmination of years of hard work," said Capt. John S. Lemmon, program manager, E-2/C-2 Airborne Tactical Data System Program Office (PMA-231). "The E-2D team continues to work together with one vision and goal – deliver a solid product to the fleet." On Aug. 3, 2007, the first E-2D Advanced Hawkeye took to the skies over St. Augustine, Fla. Since then, Northrop Grumman has delivered 10 new production E-2Ds to the U.S. Navy, on cost and on schedule. An additional 10 aircraft are in various stages of manufacturing and predelivery flight testing at the company's St. Augustine Aircraft Integration Center. Initial operational capability with the Navy remains on track for 2015. 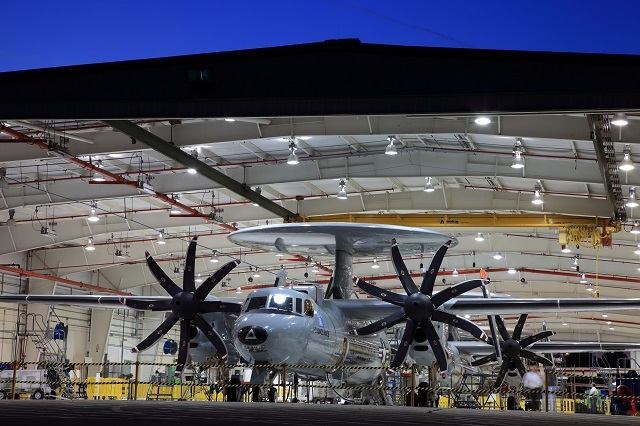 Since the first E-2D Advanced Hawkeye took to the skies over St. Augustine, Fla., for the first time in August 2007, Northrop Grumman has delivered 10 new production E-2Ds to the U.S. Navy, on cost and on schedule. An additional 10 aircraft are in various stages of manufacturing and predelivery flight testing at the company's St. Augustine Aircraft Integration Center. Initial operational capability with the Navy remains on track for 2015. The E-2D program continues to find ways to reduce costs and provide best value to the customer through improving aircraft delivery processes, standardizing repair methods and looking for opportunities to improve spares timing to increase the overall program affordability. "We've got the right people and processes in place to make a seamless transition into full-rate production," LaGrone said. 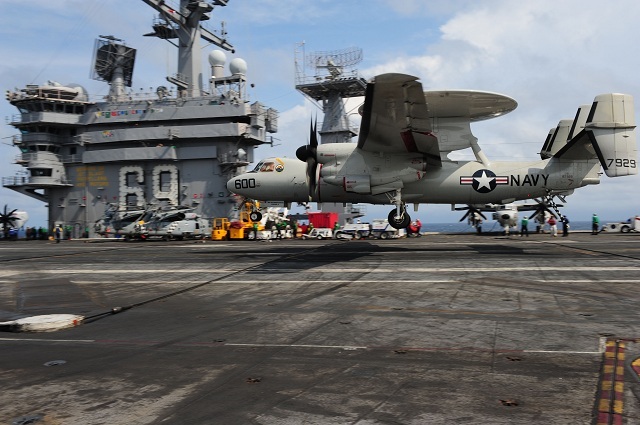 "With the Navy's E-2D program of record at 75 aircraft, full-rate production enables the production of the remaining 55 aircraft over the next 10 years and provides the opportunity for a cost-effective, multiyear procurement."